The Harvard was previously released in 1962 in a cello bag. Then again in 1963 in a box and 1964 in a cello bag again. My kit came out in 1967. It was re-released in 1978 and 1986. The Harvard I was developed in 1936 by North American Aviation. This colorful and exciting pre-war service aircraft was first ordered in 1938 by the R.A.F. at the time of Air Force expansion. In 1940, the Harvard II came into service and remained the standard R.A.F. advanced trainer throughout the war. The new design of the Harvard II featured a re-designed tail unit, wing tips and a metal covered fuselage. The popularity of the Harvard II soon spread to the United States. The U.S. Army Air Force adopted the Harvard to be known ast the AT-6 and the U.S. Navy under the designation SNJ. 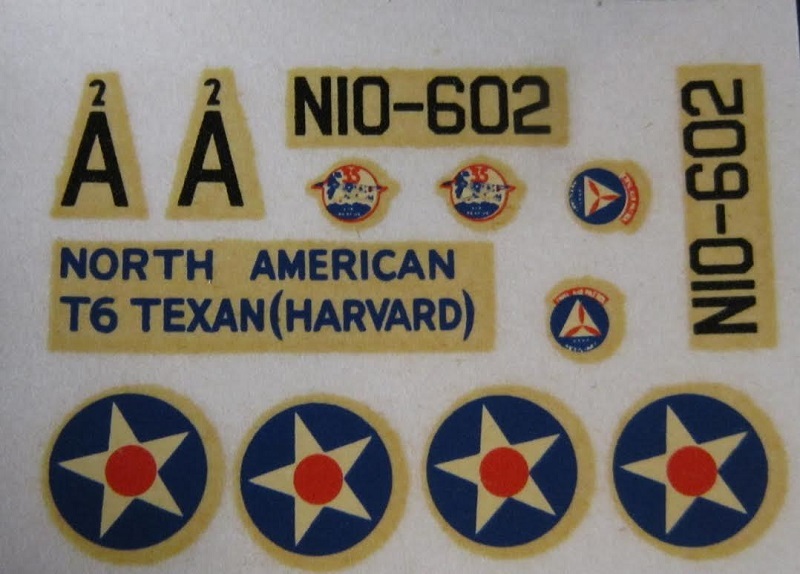 Following the war the U.S. Air Force adopted the name "Texan" and designation T-6. Production continued after the war in both the U.S.A. and Canada. Over 2,000 were re-manufactured and re-designated T-6C. The British Harvards, recognizable by their long exhuast pipe in place of the more usual stub ejector, remained in service until 1955 as advance trainers. Later, many were still employed for communications and miscellaneous duties. Designed originally as a basic combat trainer and fully aerobatic, the Harvard was an extremely versatile aircraft, capable of being armed with machine guns, bombs and rockets. Harvards in fact were used for ground-attack both in Korea and against the Mau Mau in Kenya. Some forty nations have used Harvards in their arms, and civilian uses include banner towing and sky writing. The Harvards are still in use as trainers in various cadet schools. The Harvard is powered by a 550 h.p. Pratt & Whitney Wasp radial engine giving a maximum peed of 212 m.p.h. and a range of 870 miles. Wing span is 49 ft. 01/4 ins. 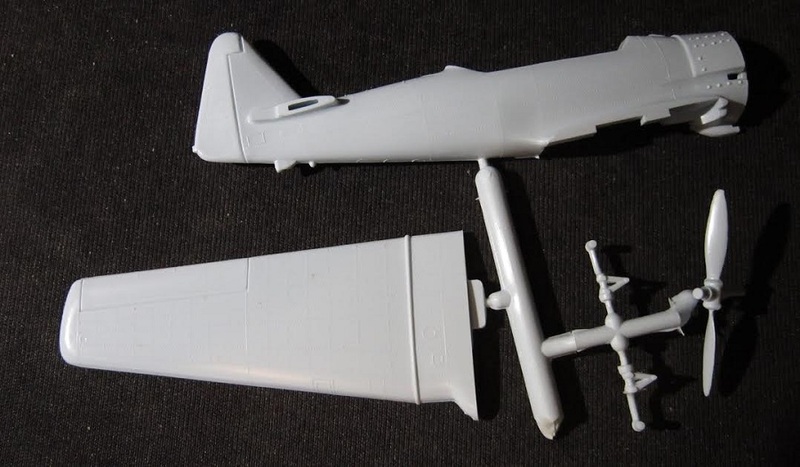 and a length of 29 ft.
Airfix is a old prolific model company based in the UK. They manufacture all manner of model subjects in the popular scales. The box is blousy and too long. 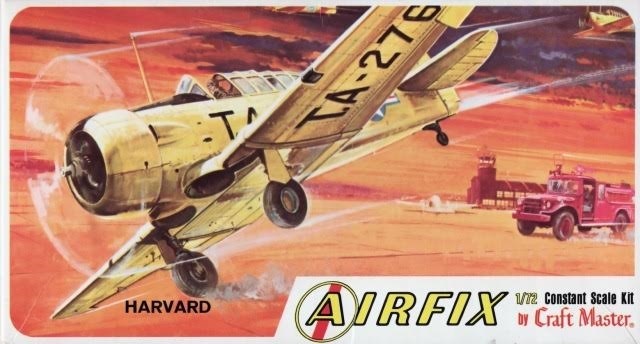 The box art shows a Harvard coming in for a landing at an airfield. It is overall white with a black anti-glare panel in front of the windscreen It has large black code letter TA-276 under its left wing. One side panel has a small color repeat of the box art followed by the history of the Harvard. The other side panel has color box arts of 3 other aircraft kits that Airfix manufactures: a Japanese Aichi "Val", a "Freedom Fighter" (Canadair CF-5 ??) it does not say and a Japanese Mitsubishi "Dinah". No kit numbers are shown for these 3 and I assume they are all to 1/72nd scale. Kit was made and litho in the USA. This kit contains 4 chalk-white trees, clear tree, black display stand, decals and instructions. 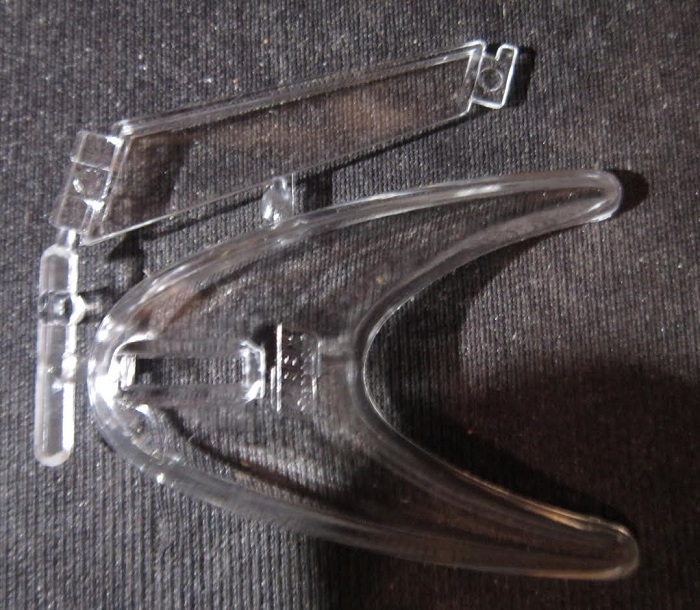 The parts are not cello bagged. The instructions consist of a singel sheet printed on both sides in 6" x 8 1/2" page format, folded twice to fit the box. 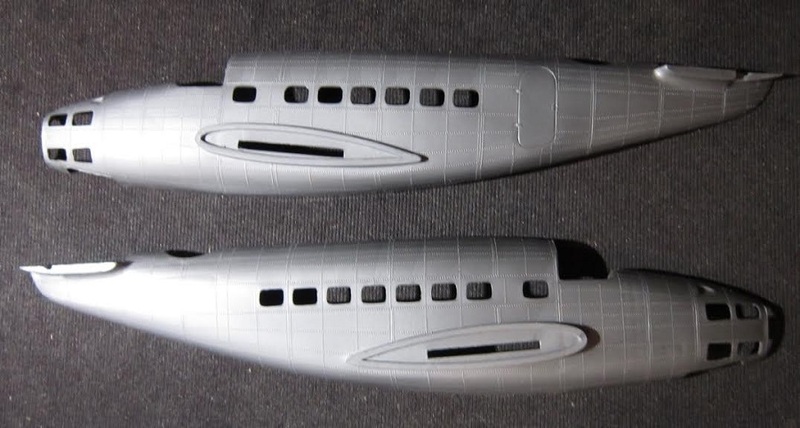 The face side begins with the history of the Harvardm, followed by the color scheme and an exploded drawing showing assembly of the fuselage, wings, elevators, pilots and their seats and a head rest. 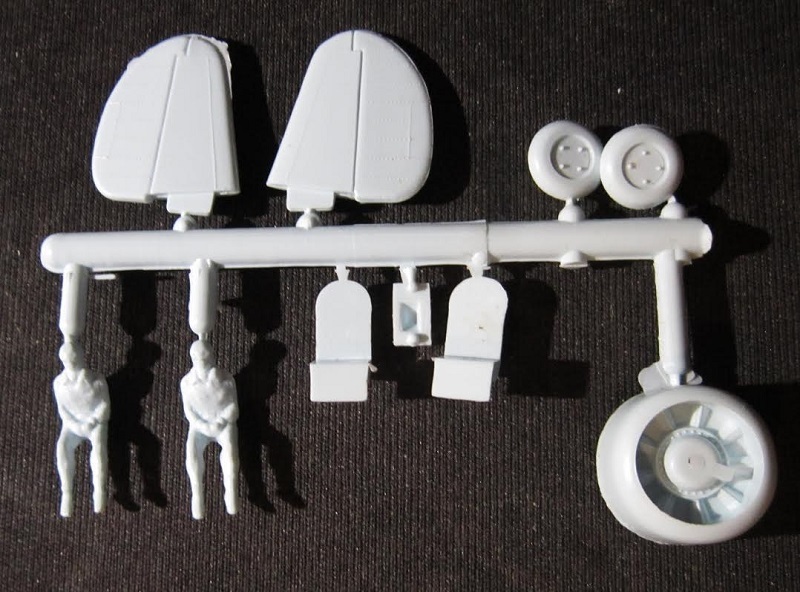 The other side of the sheet shows another exploded drawing for assembly of the air scoops, cowling, propeller and radio aerial, accompanied by text to walk the modeler through the build. A third and final exploded drawing is for assembly of the landing gear, cockpit canopy and the display stand, again with a lot of text. At the bottom of the page for replacement of parts there is the address of M.P.C.s (Airfix's U.S. importer and distributor) address at 126 Groesback Hwy., Mt. Clemens, Michigan. ​The 4th chalk white tree holds the lower wings part. ​The black display stand is 2 parts. 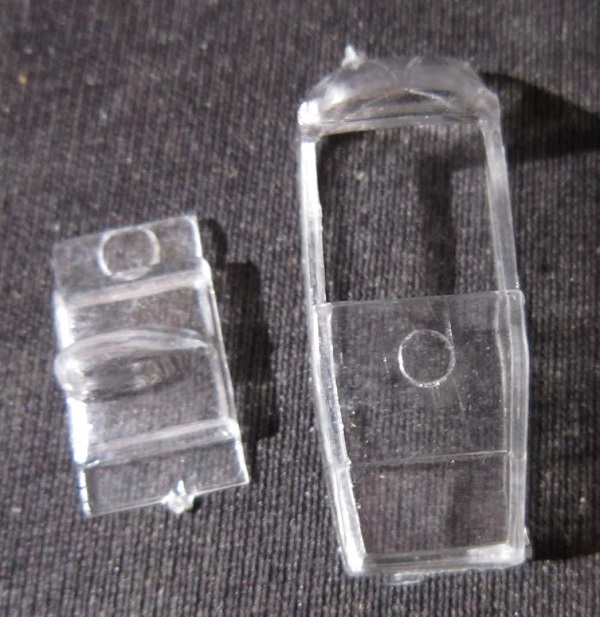 ​The single clear part is the cockpit canopy. Although there was a frosted sheet provided to protect the face of the decal, the sheet was floating around the box and not protecting anything. So, I stapled it to the decal sheet. ​There are no parts trees illustrations in the instructions and no part number tabs next tot he parts on the trees. This means extra care studying the exploded drawings to get the right parts. Bad move Airfix. Control surfaces are molded solid and the cockpit canopy is molded closed. It will take surgery to re-position flaps and open the canopy. Panel lines are of the raised variety. This is an nice older kit of a trainer aircraft.